Teaching computer programming to kids is a very popular topic right now. And rightly so, given the increasingly technological aspects of our culture. But as a parent, the thought of teaching programming to your kids might be incredibly overwhelming. That is completely understandable! Computer programming is like learning a whole other language. The great thing is, young kids are at the best possible age to learn a new language, and I’m happy to share a resource with you that will teach them programming basics and build a solid foundation. 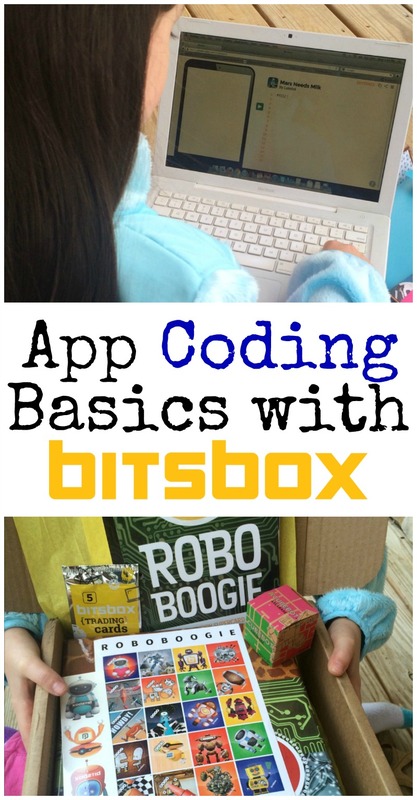 If you’re looking for a fun way to teach (and learn) programming with your kids, you will love Bitsbox. You can read my initial review of the product here to learn more details of how it works. 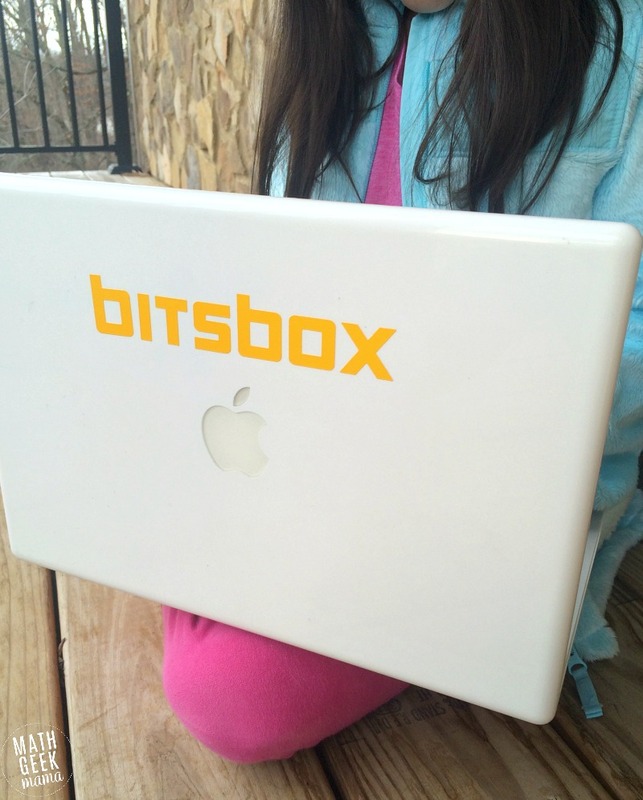 My daughter (8 years old) has been using Bitsbox for a few months now. She’s now in her second box, which introduces some new skills and builds on the coding fundamentals that she learned with the first box. Whereas the focus on the first box was learning how to place objects on the screen and understanding coordinates, she has now begun to learn how to make those objects move. So far I have enjoyed the way the challenges begin very simply, and provide lots of practice with specific skills. But they’re so fun and engaging, my daughter really doesn’t seem to realize that she’s practicing certain coding skills again and again in different ways. As I mentioned, our second Bitsbox includes challenges that introduce a new skill: making objects on the screen move. There are several “tips and tricks” cards included with specific instructions to learn this new function. This is especially helpful for parents to learn alongside their kids. While my daughter is to the point where she’s able to code apps on her own using the Bitsbox challenge cards, as the tasks get more complicated, I’m having to be a little more involved. 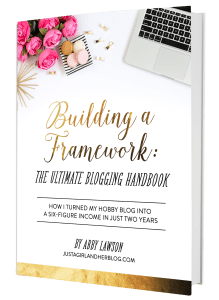 If this intimidates you, please know that there are lots of helpful resources for parents on their site, and the “tips and tricks” cards offer thorough explanations so you can understand and better help your child. 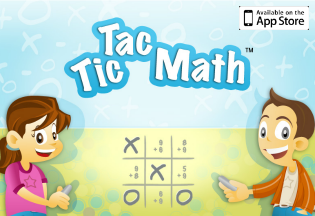 After reading and learning the new concepts with your child, they can then code the different apps to practice this new skill. My daughter also recently began trying to code apps from scratch. This means, the challenge is given (what you want the app to do) and she has to code the entire thing herself without copying theirs. This is where she is starting to need my help. The great thing about these challenges, however, is that hints are given, and other examples are available to look at to give you a starting point. For example, in box 2, there’s an app to code which allows you to draw with a robot as you drag it around the screen (and all the lines of code are given, you just copy them). Using that as an example, my daughter and I worked together to code an app (from scratch) where she draws as a robot when she drags her finger on the screen. 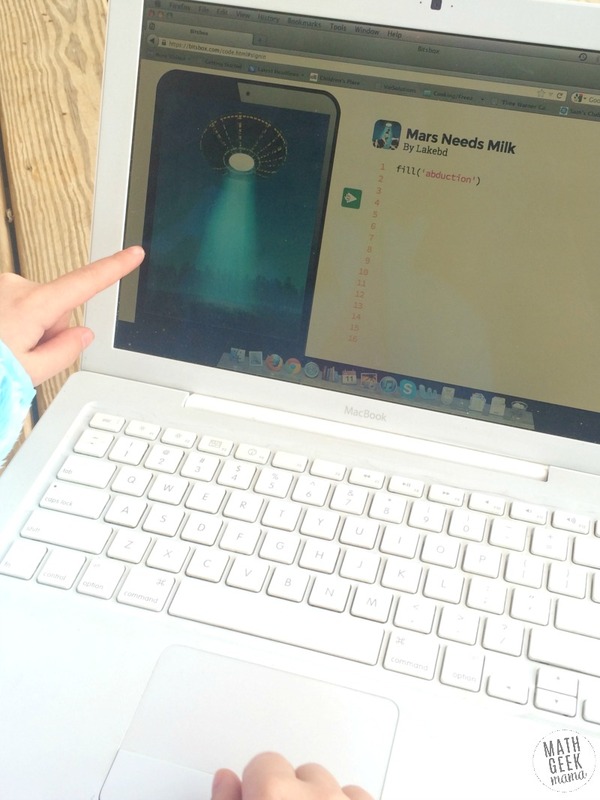 One of the best ways that she has been able to learn what bits of code do is to experiment. This simply means typing up the code for an app, then changing some of the numbers to see what happens. Especially now that she’s trying apps with a ‘move’ command, it’s often helpful to change out things in the code to see what changes with the app. For example, if you make one number bigger, does it change the size of the stamp or the speed that they move? This helps her learn what each bit of code does for when she’s ready to try and code another app from scratch. Now that we’ve got a couple of boxes worth of cards and challenges, I want to share some tips for making the most of this unique learning experience. 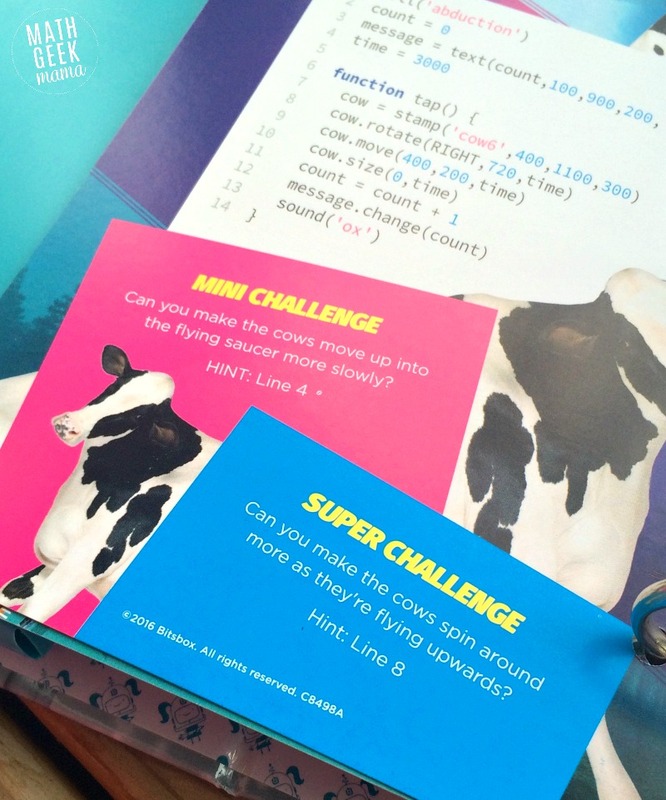 First, when you receive your binder for your challenge cards, keep the cards in order (at least until your child is comfortable with the coding they’ve learned so far). Because the challenges build on each other, it’s helpful to have them in order so if it’s been a while since your child has practiced, they can go back to the simpler apps and review what they know. You may also want to keep all the “tips and tricks” cards together at the front or back of the binder for easier reference. Second, if your child is serious about learning computer programming, set a goal of practicing 15-20 minutes a day. Experimenting with the apps for an hour one day and then not looking at it again for a week or more is not going to help them form connections and retain what they’re learning. Shorter, consistent practice will be better in the long run. I’ve started adding Bitsbox to my daughter’s daily school assignments page just as a way to remind her. (But please know that she doesn’t see Bitsbox as a school or homework assignment, she sees it as a fun game to play with). This will help them understand the basic fundamentals of programming and get them ready for greater challenges. Want to try Bitsbox for yourself or at your school? There are tons of options available for families as well as classroom teachers! You can sign up for a monthly subscription (which is what we have) and you can even save 20%! 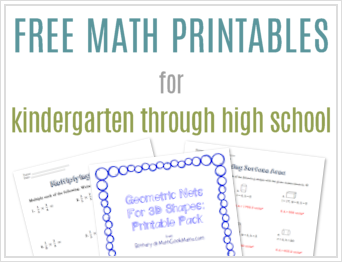 Use my unique code: MATHGEEK20 to save 20% on your first month’s subscription. Or check out their shop here to make a one time purchase (this would be a great way to test it out and see if your child has an interest in it). 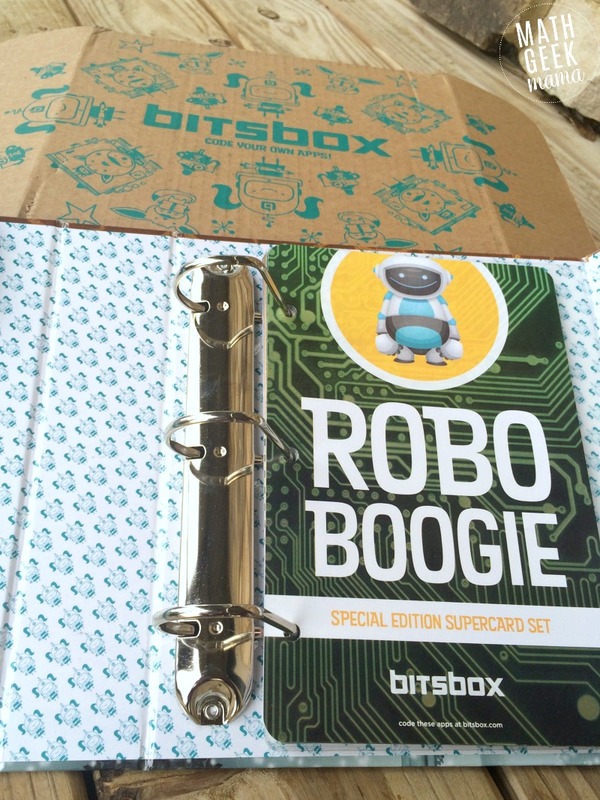 And if you’ve tried Bitsbox with your kids, be sure to share your experience in the comments! Do you consider Bitsbox to be good value for just an individual rather than in a school based environment? I do feel like it’s a good value for individual students, because the challenge cards can be completed again and again. With other subscription boxes (crafts, science projects, etc.) once the project is complete, that’s it. 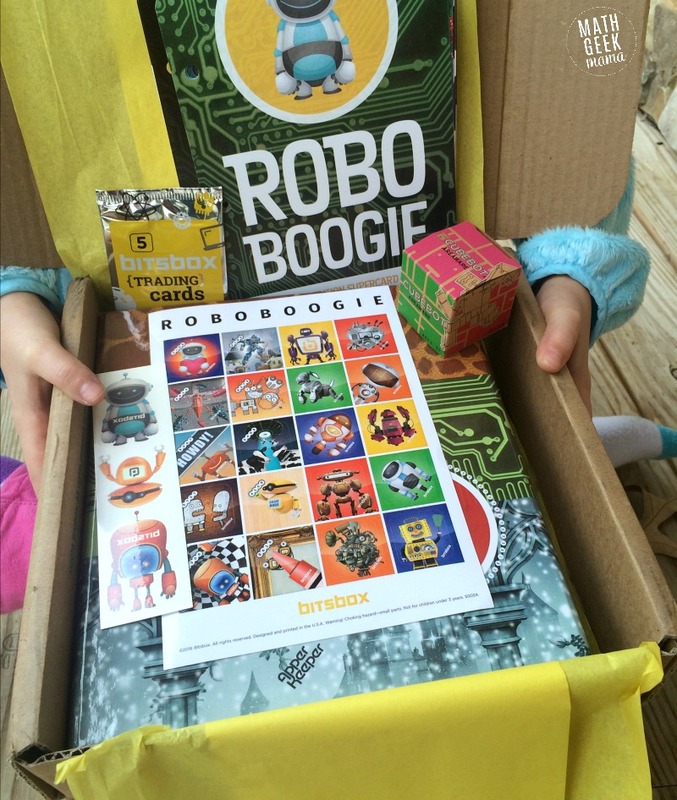 But with Bitsbox, kids can refer back to previous challenges or re-code them whenever they like.